Not too long ago, I facilitated a 3-day meeting in which a group of 10 independent organizations were working on a project to share information. This group of executives agreed to establish a set of standards for the group that would allow them to share development costs for a software product. We had 2 days to establish a base set of standards to support the needs of the individual organization as well as their community at large. The standards had to include enough detail so that the software development team could propose solutions, but general enough to allow for flexibility during the creative process. Why? Preparation, spirit of agreement, and lots of paper! Before the team assembled, we established the goals for the workshop. 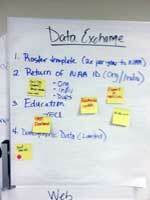 I met with the project manager and business analyst for a full day to prepare each major objective. We developed a series of flip charts with requirements and assumptions from the group. We developed the 4 magic flip charts and assembled all of our supplies! 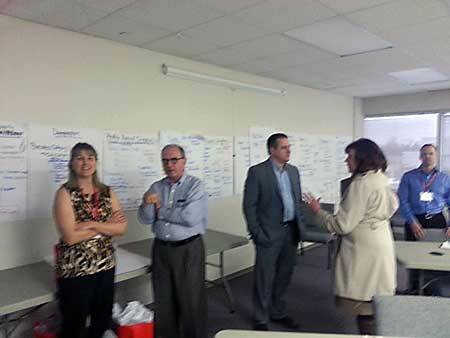 The team started by reviewing and refining the goals and objectives, agenda, and ground rules. We developed a parking lot and placed it in the room – but off to the side so it was not a distraction. Here are some specific tricks of the trade that we used to get to success. When you are making decisions, color matters. 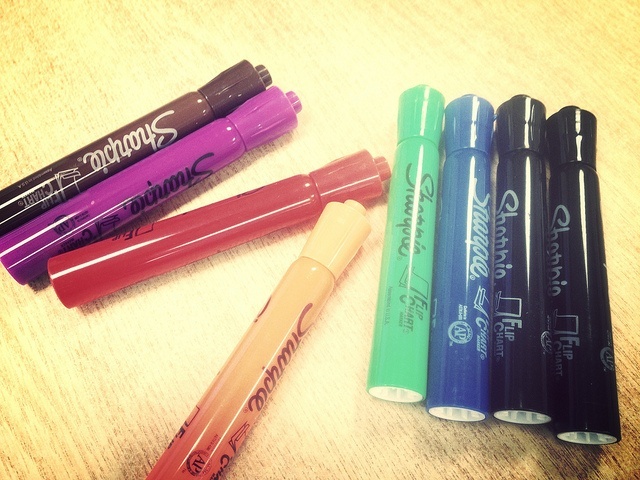 Why should a good facilitator bring their own stash of markers? Green and blue are the most important colors and therefore are frequently overused and dried out. It’s very difficult to build consensus when you write notes in RED! Black/Brown – Use to label EVERY flip chart. Dark colors make a statement. Blue – Note comments in blue; it is a neutral color. Green – When teams are brainstorming or listing options, all positive options should be noted in GREEN. Each option should be listed with a + [plus sign]. Red – When teams are brainstorming or listing options, all negative options should be noted in RED. Each option should be listed with a – [minus sign]. Orange/Yellow – Avoid these colors because they are hard to read/differentiate from a distance. green dots to indicate the dependency of one item to another. Several members of the group needed to think about their needs, so they wrote their ideas on sticky notes. They wrote one idea per note and I added them to the list. During the meeting, people would use sticky notes to add parking lot items to the list during other discussions; they were engaged because they were contributing, but didn’t want to interrupt a good discussion. Breaks are critical! Even when people are in the middle of a great discussion, their brains still need to take a break. The facilitator must monitor the agenda and call breaks. The team may wish to renegotiate the break time, but it must be discussed with the group. It is recommended that the team pick a break time that is not an even number (10, 15 min.). Why? If you schedule a break for 12 minutes, more people return on time! Moreover, deciding the duration of breaks is another opportunity to build agreement. When the break is almost over, use the train whistle as a sign to return to the room. It’s a lot more effective than trying to yell or herd people. 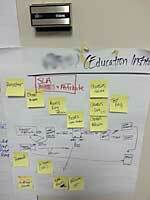 The facilitator must make sure they write everything that is shared by the team. They cannot ignore comments that they deem as unnecessary. Spelling isn’t everything – write as quickly and clearly as possible. As people share information, you can develop a pace by repeating what someone said as you write. This allows the facilitator time to write the information as well as provide feedback to the team member. 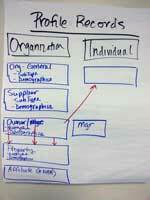 If there is a long discussion, the facilitator should ask the group to provide a summary or “headline” for the idea. The facilitator should practice standing and writing so their back is not to the group. Stand with your body facing the group then lean slightly toward the paper. Everyone has a hard time staying engaged in long meetings. 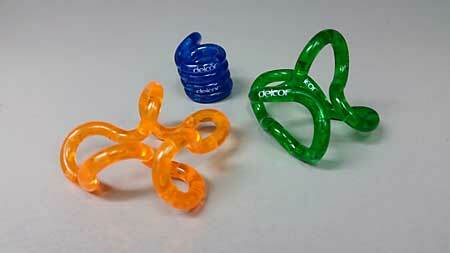 Use of fidget toys allows people to have a positive outlet for their energy. For tactile members of the team, holding a koosh ball or playing with a fidget toy allows them to focus. Try it! At the beginning of the meeting, the team defined consensus. They decided that they could live with a solution that was of “B” quality. They may eventually design an “A” solution, but in order to keep things moving, they agreed to start with a solid “B.” Our team followed the agenda, took a lot of breaks and finished the work ON TIME! Feedback from the group was very good. They said they felt included, were able to share their ideas, and found agreement with their peers. The developers were happy to be included in the discussion so they could understand the context of key discussions while having lots of notes. It served as a great start to the entire project.